New Fleetwood boss John Sheridan may want smiles across the board but says it’s no laughing matter come kick-off time as Town aim to beat the drop. 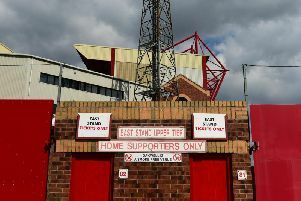 Fleetwood are in the relegation zone heading into the Highbury clash with Plymouth Argyle but training has been noticeably different since Sheridan took over from Uwe Rosler. The difference isn’t just in methods and tactics but the players were also a lot more vocal in the Thursday session before Sheridan’s pre-match press conference. “I want them to enjoy training,” Sheridan said. “They are very lucky young players; I want them to come in and do things properly and train as though they are enjoying it. “They are in a very fortunate position – come in and have a smile on your face. “I like people being closer together and winding each other up but when it is football we have to take it very seriously; I shouldn’t have to tell them that. “They shouldn’t have to be told that. “You come in, and when the time is right to have a laugh and a joke, you can do it but you have got to concentrate and be serious. Several first team players like Jordy Hiwula, Bobby Grant and Wes Burns all featured in the development squad’s 2-2 draw with Oldham Athletic in midweek. However, Preston North End loanee Kevin O’Connor – who has not been selected for the previous two squads despite being fit – picked up an ankle knock in that match that will see him miss the Plymouth game. Grant and Hiwula both scored for the development squad and Sheridan wants everybody to be prepared for when they are required. He said: “They did not let themselves down; there was a good attitude and a good performance. “Jordy scored, Bobby scored; they are all in and around the first team and they have got to be ready for when I call upon them. “Wes Burns is another; they are going to have games from now until the end of the season and it is important they get match time because we are going to need them.